Finegrained DNA research in the near future might very well contradict some of the findings i have presented earlier. For whatever reason it may turn out that some ethnic groups passed on their genetic legacy disproportionate to their estimated share of population or to their cultural, linguistical significance. Then again it might also confirm some of the findings in greater detail. I won’t name all the possible objections you could have about presentday BGA (biogeographical analysis) & DNA testing. It’s obvious it’s far from 100% accurate yet and perhaps it may never really be because of inherent contradictions. Still it can already be used to gather some indicative (not conclusive) data. 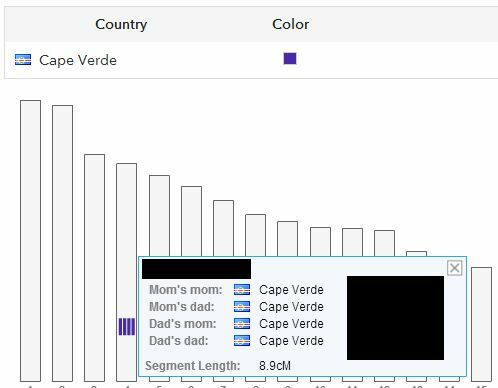 I will just show some mtDNA studies as well the autosomal DNA results of Cape Verdeans on 23andme. It’s only a very sketchy outlook but on a whole it does seem to be in line with what I discussed earlier. To start off this very early pioneering effort (1957!!!) to find traces of specific ethnic/regional African origins within Cape Verdeans bloodgroups! 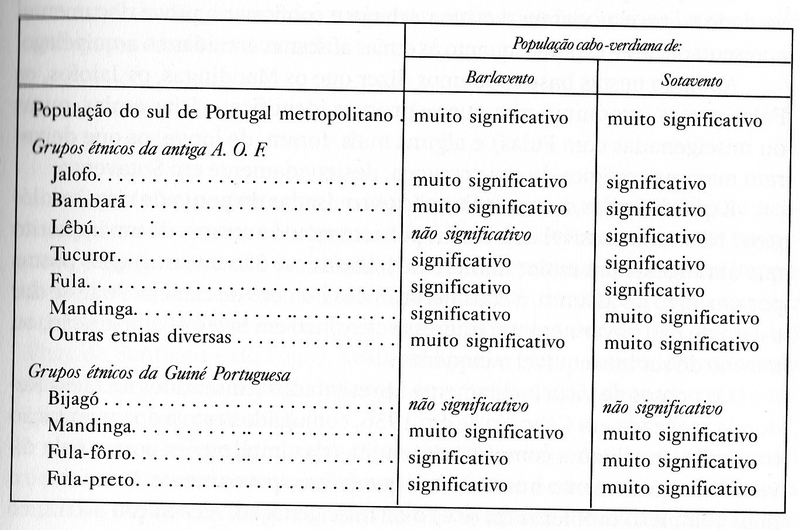 It was used by the oftquoted Cape Verdean historian Antonio Carreira to claim that the Wolof, Mandinga and Fula would be among the main ethnic elements for Cape Verdeans. However he already acknowledged himself that there was a severe lack of samples, something that hasn’t changed till this day. Em 1957, Almerindo Lessa e Jacques Ruffié publicaram, em edição da Junta de Investigações do Ultramar, um volume contendo dois trabalhos, intitulados Seroantropologia das Ilhas de Cabo Verde e Mesa Redonda sobre o Homem Cabo- Verdiano. There’s been two studies on Cape Verdean maternal haplogroups i know of which concluded they were as a whole reflective of Senegambian/Guinea and even in part of Mauretania. Uniparental analysis is of course less predictive of ancestral composition than autosomal analysis which considers the entire DNA and not just direct parental lineages. But still given the inherent limitations very interesting outcomes. Our admixture analysis indicated that the current population of Cabo Verde derives solely from West Africa (~100% from W/WC, not including Bantu speakers or Pygmy), namely from West Niger-Congo speakers of Guinea-Bissau, Senegal, and Sierra Leone (~90%) and Semitic/Berber speakers of Mauritania, Mali and Western Sahara (~10%). This study basically compares the Cape Verdean mtDNA variation with an extensive database consisting of 5800 individuals from 143 African populations. 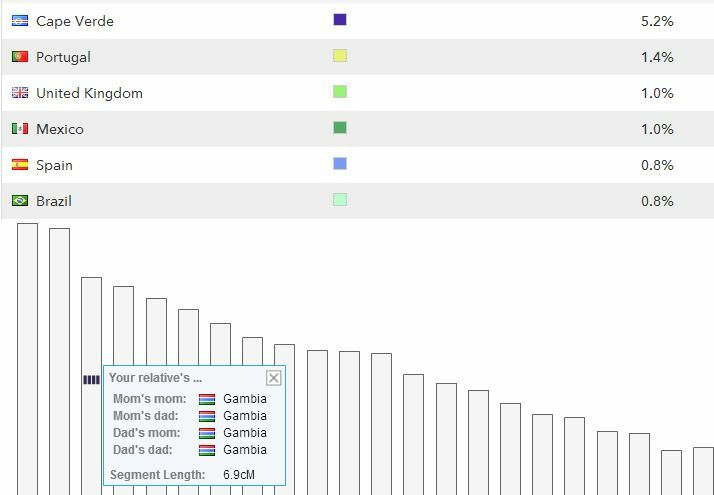 In the first chart 41% of Cape Verdean maternal haplo’s are being shown as most similar to Wolof/Lebou and 59% similar to mtDNA variation in Guiné Bissau and Mali. Of course this shouldn’t be mutually exclusive ancestrally speaking. Also interesting to see the relatively high Berber/Mauretania similarity being mentioned. This corroborates the minor North African %’s scored by Cape Verdeans who got tested by the personal DNA testing company 23andme (i will expand on this later on). This North African affinity could signal either direct ancestry from Berber/Morisco’s/Guanche but also indirectly via Fula. Eventhough in this particular study no similarity was found with Fula mtDNA variation, but that’s perhaps because their Fula samples are not from Upper Guinea but from Cameroon/Niger/Burkina Faso. In order to study the matrilineal genetic composition in Cabo Verde (Republic of Cape Verde), an archipelago that used to serve as a Portuguese entrepot of the Atlantic slave trade, we have analysed a total of 292 mtDNAs sampled from the seven inhabitated islands for the hypervariable segment I (HVS-I) and some characteristic RFLPs of the coding regions. The different settlement history of the northwestern group of the islands is well reflected in the mtDNA pool. The total Cabo Verde sample clearly displays the characteristic mitochondrial features of the Atlantic fringe of western Africa and testies to almost no mitochondrial input from the Portuguese colonizers. 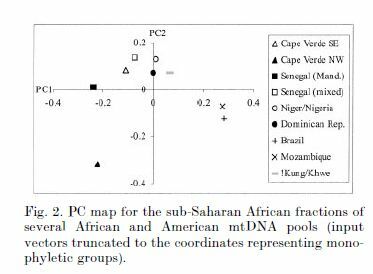 Basically this study is saying that Cape Verde’s mtDNA profile fits best with the mtDNA variation as found in Senegambia. with Niger}Nigeria, and Brazil with Mozambique. Interesting quote about the northwestern Cape Verdean islands (Barlavento) having a subset of variety as found in Santiago/Fogo. (“SE Cabo Verde”) Also intriguing the mentioning of possibly Mandenka fugitive slaves populating Santo Antão. Surely there must have been other ethnicities involved as well though. Too bad they provide no reference/footnote for it. fully the haplotype composition of Cabo Verde. Again some differentiation is being picked up between the northern (Barlavento) and southern (Sotavento) islands. Because of genetic drift and smaller founding populations in the Barlavento (Santo Antão & São Nicolau) and a bigger impact of continued lowlevel slave imports during the 1700’s/1800’s in Sotavento (Fogo & Santiago) it may be assumed that the diversity of African origins in Barlavento is largely a subset of the greater diversity found in Sotavento. On the other hand it may also be that some lineages/ancestries could be unique to either Barlavento or Sotavento because they were introduced by atypical North European slavetrading in the 1700’s. I’ve seen some historical references being made to English/French ships selling slaves in Cape Verde (illegally) from Senegambia, but also further away (Benin and even Congo). The numbers involved must have been small though because Cape Verdean slaveowning elites were very much impoverished at that time and production in the slavelabour sectors was decreasing if anything. into a common cultural and social background. subsequent input of independent external migrations. Because generally speaking African origins for Cape Verdeans might date back 300-500 years, it’s to be expected they will mostly share smaller segments with mainland Africans. 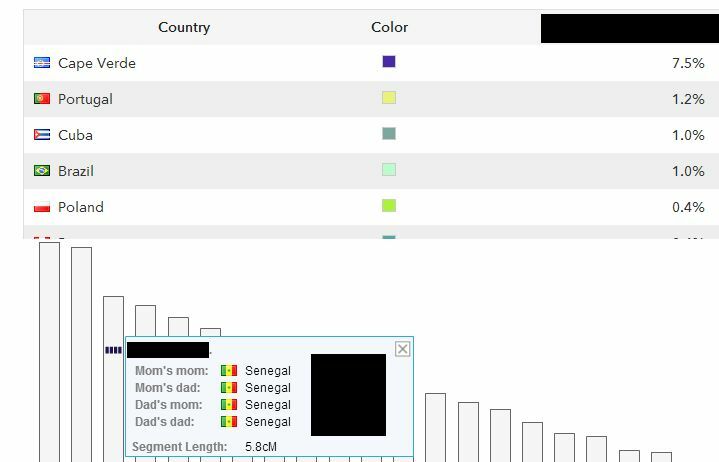 The database of 23andme is consisting of it’s mostly USA-based customers and therefore very limited still for Africans. Although I think it might already have about 10 Upper Guineans (Senegalese, Gambians, Guineans). 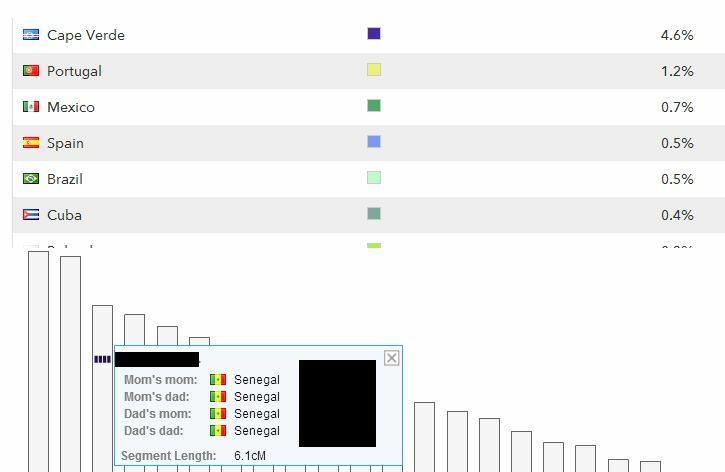 From the over 20 Cape Verdeans i’m sharing with myself on 23andme these are their African DNA matches/”cousins” sofar. Basically it’s detecting shared DNA segments which might be indicative of shared ancestry. This is the biggest match, the Guinean person being a Mandinga (i’m also sharing with him) and the Cape Verdean he’s matching being from Fogo. Perhaps a connection to relatively late Mandinga presence in Cape Verde (1700’s/1800’s)? Seems to be the same DNA segment on chromosome 3 for 2 Cape Verdean persons who are only distant DNA cousins, not recently related. 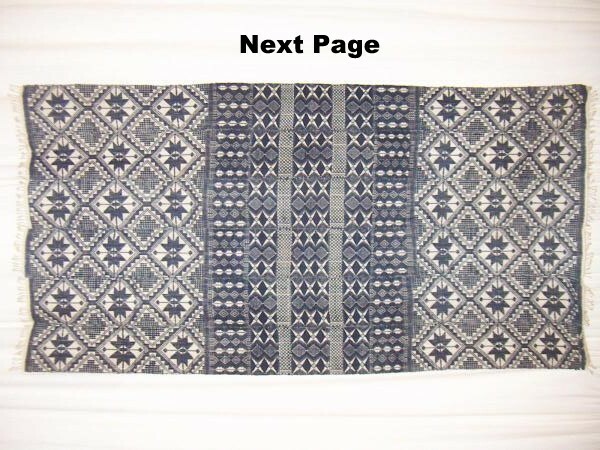 So perhaps this might be some ancient segment (1500’s) circulating/being recycled in the Cape Verdean genepool?